New Blood Better for Law & Order: CI? Is Law & Order: Criminal Intent better off with quasi-newbies Chris Noth and Annabella Sciorra than Vincent D'Onofrio and Kathryn Erbe? The N.Y. Post's Adam Buckman sure thinks so. I've only seen the one episode so far, but after a few more I'll likely be easily swayed as well. D'Onofrio's character is kind of one-note for me these days. Another little detail on the power play at ABC's Commander In Chief. Even though Rod Lurie will keep his Executive producer credit while Steven Bochco takes over the day-to-day operations, the title is largely ceremonial, according to today's New York Times. He'll have little, if anything, to do with the show from this point on. They also say the prime motivator for the shitcanning was that Lurie had fallen way behind in production, and ABC was worried there wouldn't be enough fresh episodes for ssweeps. 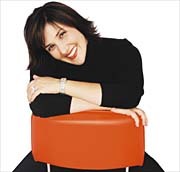 Chubby divorcee Ricki Lake is apparently preparing a return to daytime TV. Oh, joy! More trashy crap on daytime TV! Intense negotiations are ongoing with three studios, and an annoucement appears likely within the month. How do you make a fake live debate a bit more quasi-real? Hire a former TV anchor to moderate. Former ABC and MSNBC anchor Forrest Sawyer will play himself in the November 6th live episode of the long-in-tooth political potboiler, and will act as middle man in the fictional debate between the two candidates stumping for Charlie Sheen's spot.